Top 10 Archives - VIRTUALIZATION IS LIFE! 2017 is done and dusted and looking back on the blog over the last twelve months I’ve not been able to keep the pace up compared to the previous two years in terms of churning out content. In 2017 I managed 90 posts (including this one) which was down on the 124 last year and the 110 in 2016. My goal has always been to put out at least two quality posts a week, however I found that the travel component of my new role has impacted my productivity and tinkering time, which is where a lot of the content comes from…however it was still a record year for site visits (up over 200K) and I did manage to publish the 400th blog post on Virtualization is Life! since going live in 2012. Looking back through the statistics generated via JetPack, I’ve listed the Top 10 Blog Posts from the last 12 months. This year the VCSA, NSX, vCenter Upgrades/Migrations and Homelab posts dominating the top ten. As I posted about a couple months back the common 503 error for the VCSA is a trending search topic. I was also happy that my post on my Working from Home experience over the last 12 months resonated with a lot of people. In terms of the Top 10 new posts created in 2017, the list looks more representative of my Veeam content with a lot of interest for Veeam PN and also, as I would hope my vCloud Director posts. This year I was honoured to have this blog voted #19 in the TopvBlog2017 which I am very proud and I’d like to thank the readers and supporters of this blog for voting for me! And thanks must also go to my site sponsors who are all listed on the right hand side of this page. 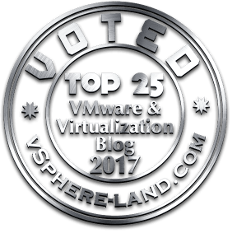 Again while I found it difficult to keep up the pace with previous years I fully intend to keep on pushing this blog by keeping it strong to it’s roots of vCloud Director and core VMware technologies like NSX and vSAN. There will be a lot of Veeam posts around product deep dives, release info and I’ll continue to generate content around what I am passionate about…and that includes all things hosting, cloud and availability! I hope you can join me in 2018!